What you just read is a $1.4 million dollar judgement against Aaron Rubashkin and his various meat companies, including Agriprocessors, Inc. based in Postville, Iowa, and against Nevel, Rubashkin's real estate company. Rubashkin, I'm told, owns 10-20% of the housing stock in Postville. Apparently he 'sold' meat to the hasidic controlled Allou Healthcare – about $2 million dollars worth. Problem is, Allou distributed healthcare and beauty items and was not in the food business. In other words, Allou paid Rubashkin for product it did not sell. This may be a kickback scheme of some type, similar to the money laundering scheme the Spinka Rebbe was arrested for. Top executives of Allou Healthcare Inc. and related companies have pleaded guilty to crimes arising from a massive corporate fraud scheme at Allou. The indictment obtained by the U.S. Attorney's office for the Eastern District of New York detailed a staggering, decade-long bank fraud and securities fraud scheme involving hundreds of millions of dollars of phony sales and grossly inflated inventory, and a mail fraud and insurance fraud scheme arising from a fire at Allou's Brooklyn warehouse involving a false insurance claim and the bribery of an undercover fre marshal to change the cause of the fire from "arson" to "accidental." 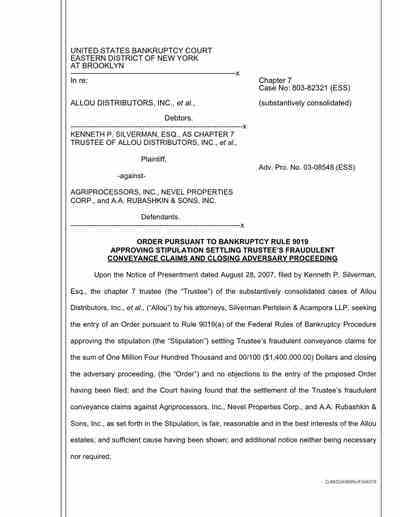 The related schemes resulted in losses to creditors, investors, and other victims in the amount of an estimated $160 million and ultimately drove Allou into bankruptcy. 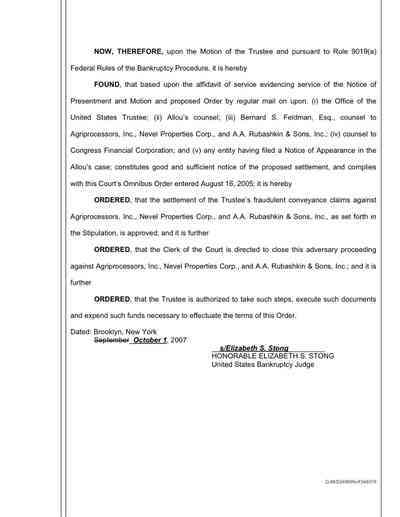 Under the terms of their respective plea agreements, Herman Jacobowitz,45, Allou's chief executive officer, pleaded guilty to conspiracy to commit bank fraud, securities fraud, and mail fraud, and to a substantive count of filing a false annual report with the Securities and Exchange Commission , and faces up to 15 years' imprisonment and a maximum fine of up to twice the amount of the loss from the fraud. Jacob Jacobowitz, 44, Allou's executive vice president, pleaded guilty to filing a false annual report with the SEC, and faces up to 10 years' imprisonment and a maximum fine of $1,000,000. Aaron Jacobowitz, manager of various companies controlled by the Jacobowitz family, pleaded guilty to money laundering and faces up to 10 years' imprisonment and a maximum fine of up to twice the amount of the loss from the fraud, or twice the amount of the laundered funds, whichever is greater. In addition, Herman and Aaron Jacobowitz agreed to forfeit to the government up to $130 million, and Jacob Jacobowitz agreed to forfeit up to $10 million. The guilty plea proceedings were held before U.S. District Judge John Gleeson at the U. S. Courthouse in Brooklyn. In the last three years, Agriprocessors has paid the Environmental Protection Agency and/or OSHA more than $750,000 in fines.